“I would like to tell you about my awesome nutrition coach, Meagan, and how I came to work with her. I am a forty-something mother and wife. I have two teenage boys who are busy and I work in education. My calendar is full! The decision to work with a nutrition coach was not something that happened over night. I have struggled with my weight for years and it has actually taken quite a long time for me to be really ready to tackle this. I have tried some weight loss programs, worked with nutritionists, and tried it on my own. I have not been very successful with these attempts. Over the years my weight has slowly increased and I have had some issues with my blood pressure. A couple of trips to the emergency room with high readings gave me motivation to make some changes. I finally decided to start and Meagan became my new “go-to” person. My weight loss has been slow and I have decided that slow is okay with me. In five and half months I am down fourteen pounds. Meagan is amazing! She gives me the Macro numbers to aim for and I do my best to follow. If I go off path, she patiently waits for me to get back on track. If something is not working for me, we make an adjustment. Sometimes I get frustrated that the number on the scale is not moving down much and Meagan reminds me that the number is not going up either. Did I mention she is patient? She is REALLY patient. Along with giving me helpful feedback and suggestions, she always has positive things to say about this journey. It took a little while for my food habits to begin to change. I still crave foods that are not ideal and I do indulge sometimes, but overall I am consistently making better food choices. My body feels better and that makes me happy. Meagan is a perfect fit for me as a nutrition coach because she is realistic about what my everyday life is about. She gets it… I have kids— She does too! Mine are teenagers – She has teenagers! My life is really busy working and hauling kids around – So is hers! I need a recipe- She has some she will send me! I have a question in between our meetings—I can text her! On the fence about a nutrition coach? No problem! 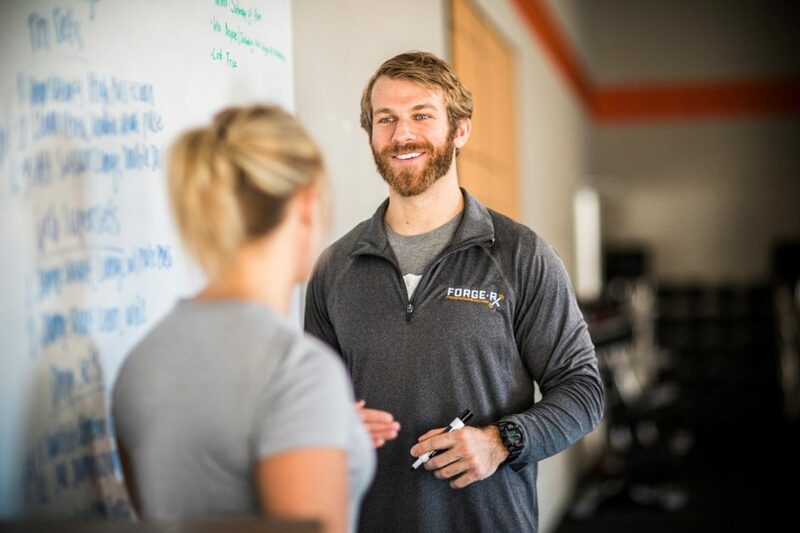 Comment your email below or email us at nutrition@forge-rx.com for an in person chat or phone call. We want to help!!!! !